- Reflector: (spherical, not parabolic) is 305m. (1000ft.) in diameter, and 51.4m. (167ft.) deep. - Reflector Surface: consists of almost 40,000 perforated aluminum plates measuring approximately 1m. by 2m. each. - Platform: the 900 ton steel structure which is supported 139m. (450ft.) above the reflector. The platform houses the gregorian dome, as well as the mechanical equipment necessary to move the dome along the azimuth arm. - Support: 3 guyed concrete towers (1 x 112m. (365ft. ), 2 x 82m.(265ft.)). Each tower is back-guyed by seven 8.25cm. (3.25in.) diameter bridge cables, to concrete anchors in the ground. - Transmitter: a 1MW transmitter, located inside the Gregorian dome, is used to bounce radar waves off of various objects in the solar system. The radar echoes are analyzed to provide information about the surface properties and dynamics of these objects. Fame: Tallest building in the USA, west of the Mississippi River. View the Stratosphere Tower on a Google map. Where can I learn about the Stratosphere Tower? Location: East of Datil, New Mexico, USA. Fame: World's Largest Radio Telescope Array. "...The 27 dishes, which look like huge television satellite receivers, move along three sets of railroad tracks. Each spur is 13 miles long and the three spurs are laid out in the shape of a Y - which is called the array. The north arm crosses U.S. 60. The dishes can be lifted and moved along the array by a special engine. Because the dishes observe together, they are the collective equivalent of a radio telescope 20 miles across. Like a regiment of soldiers, the dishes rotate in unison as they track celestial objects or zero in on a new star, galaxy or even a suspected black hole. Hundreds of astronomers observe here annually. The dishes were featured in the opening scenes of the movie, "2010: A Space Odyssey," and are irresistible to shutterbugs. They provide a high-tech contrast to the desert landscape, its mountains, cattle herds and windmills..."
View the VLA on a Google map. Where can I learn about the VLA? Fame: One of the most voluminous buildings in the world. - Flag & Bicentennial Emblem: Added in 1976, required 6,000 gallons of paint. The flag is 64 x 33.5 meters (209 x 110 ft) in size. Each strip on the flag is as big as the tour buses used to transport visitors around KSC. - Piling: 4,225 open-end steel pipe piles, 0.4 meters (16 inches) in diameter were driven 49 meters (160 ft) into bedrock. - Air Conditioning: 9,070 metric tons (10,000 tons), 125 ventilators. - Lifting Devices: 71 cranes; two 227 metric ton (250 ton) bridge cranes. - Siding: 100,800 sq meters (1,085,000 sq ft) insulated aluminum panels; 6,503 sq meters (70,000 sq ft) plastic panels. - Doors: There are 4 High Bay doors. Each opening is 139 meters (456 ft) high. The north entry to the transfer aisle was widened 12.2 meters (40ft) to permit entry of the Orbiter, and slotted at the center to accommodate its vertical stabilizer. View the VAB on a Google map. Where can I learn about the VAB? Height: 726.4 feet from top to bottom. Thickness: 45 feet at the top, 660 feet thick at the base. Concrete volume: 3.25 million cubic yards of concrete. Fame: The tallest all-concrete dam in the USA. -The Stratosphere Tower is the tallest free-standing tower in the United States, rising taller than Seattle's Space Needle, the Eiffel Tower, and the famed Tokyo Tower. - More than three times taller than any other building in Nevada, the Stratosphere Tower soars 1,149 feet (135 stories) above the Las Vegas valley -- the tallest building west of the Mississippi. - The Stratosphere Tower has 12 levels. - Indoor and Outdoor Observation Decks give visitors an awe-inspiring view of the entire Las Vegas valley and beyond, and offer several shopping opportunities. - Four high-speed, double-deck elevators that travel 1,400 feet per minute whisk guests from ground level to the observation decks in 40 seconds. Traveling at up to 2,500 feet per minute, these are the world's fastest elevators. - Elevators make 20 round trips per hour. Eight passenger cabins hold 16 people each. Open 24 hours a day, seven days a week, the Stratosphere Tower is equipped with a special lighting system designed to provide a spectacular light show nightly. View Hoover Dam on a Google map. 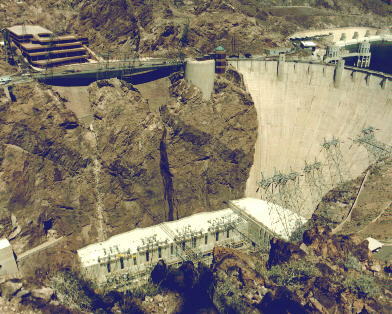 Where can I learn about Hoover Dam? 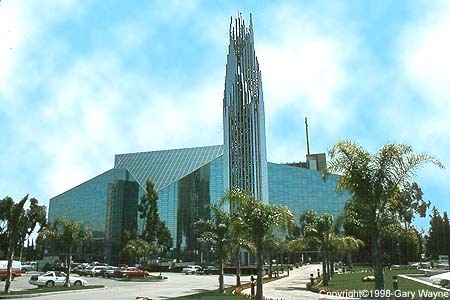 View the Crystal Cathedral on a Google map. 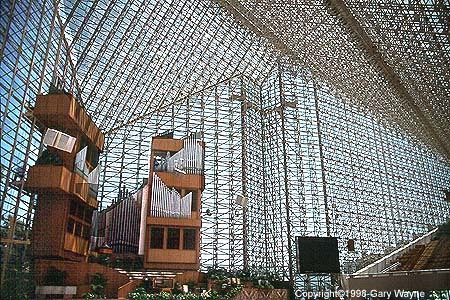 Where can I learn about the Crystal Cathedral? Fame: World's largest glass building. - The Cathedral's 16,000-pipe pipe organ is among the five largest in the world. - Seating capacity is 3,000 persons. - The Cathedral is constructed from over 12,000 panes of glass. Gary Wayne's Seeing Stars in Hollywood site (Churches of the Stars). View the Arecibo Radio Telescope on a Google map. 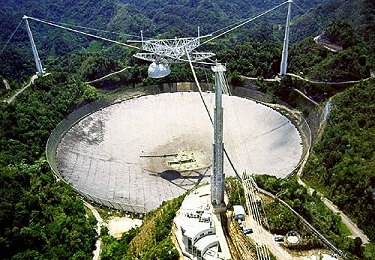 Where can I learn about the Arecibo Radio Telescope? Location: South of Arecibo, Puerto Rico. Fame: The world's largest curved focussing antenna. - Height of building (ft.): 77' 3.5"
View the Pentagon on a Google map. 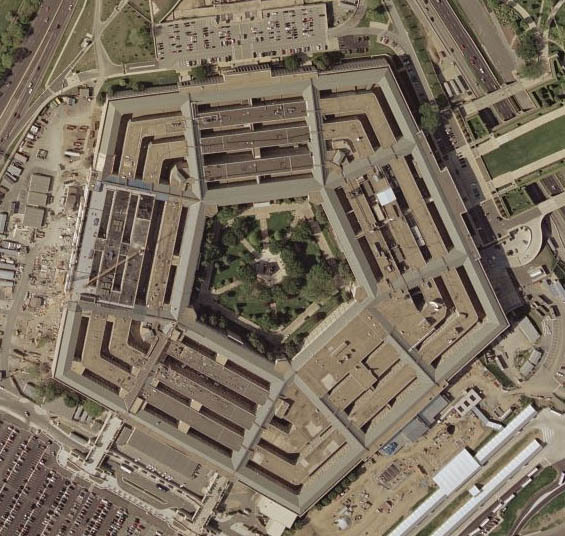 Where can I learn about the Pentagon? Location: Arlington County, Virginia, USA. Fame: One of the world's largest office buildings. - Each leg of the arch is a hollow, concrete equilateral triangle. The length of the sides of each triangle taper from 54ft (16.5m) to 17ft (5.2m) at the top. - Tourists may travel to the top of the arch via a unique tramway system. View the Gateway Arch on a Google map. Where can I learn about the Gateway Arch? Location: St. Louis, Missouri, USA. Fame: The world's largest man-made arch.